The English and Foreign Languages University invited Dr B Prasada Rao, IPS, former DGP of united Andhra as the first eminent personality to its “Meet a Leading Light” programme. Sharing his success stories with the students, Dr B Prasada Rao spoke to them about the need for dedication and perseverance in achieving one’s goals. He also explained how leadership skills and communication skills will help students solve complex problems in life. 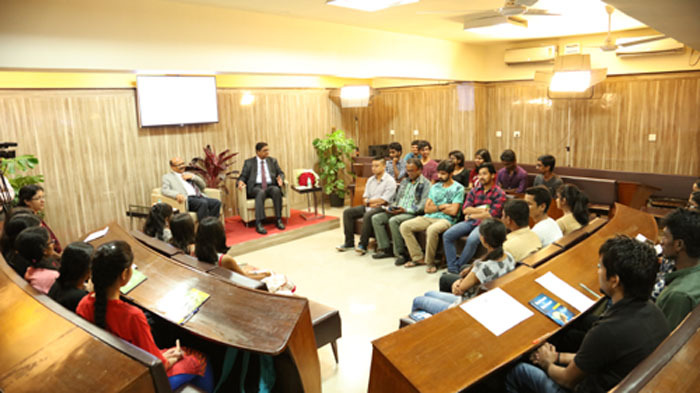 A group of 30 students were selected from first semester BA programmes to interact with Dr. Prasada Rao. The interaction was followed by students lunching with Dr. Prasada Rao and the Vice Chancellor. Participating students expressed their appreciation for the novel concept and shared that such interactions will help them immensely. Meet a Leading Light, is a unique programme conceived by Prof E Suresh Kumar, the Vice Chancellor of EFL University, to provide a platform for students to interact with eminent personalities from industry, institutions, bureaucracy, government, ministries etc., across the country. Prof E Suresh Kumar explains that MALL hopes to contribute to change, and uplift higher education as practised by the EFL University. Prof. E Suresh Kumar, Vice Chancellor, EFL University .